If eugenics makes a come-back, it will likely be as a consumer option, which explains why it tends to be championed by libertarians. A recent report, however, is raising the specter of old-fashioned, state-sponsored eugenics, and doing so from what appears to be a thoroughly libertarian perspective. The report is from the Citizens’ Council on Health Care (CCHC) in St. Paul, MN, and written by its President, Twila Brase. It focuses on the practice of testing the DNA of newborns and keeping the results on file, often without fully informed parental consent. As a consequence, Brase speculates, the government may soon have enough data about individuals to make genetically-based decisions about who would be a “burden on society.” Given that, her logic goes, might not some see it as in society’s interest at least to sterilize them? Brase is a committed opponent of “socialized medicine” (video here of a “Tea Party” speech) who recommends that genetic screening programs be privatized as a “protective strategy.” Clearly libertarian, then, in her general approach; but worried about eugenics. What gives? There is no contradiction: Brase’s concern is with what some call “negative eugenics” — government programs to discriminate against, sterilize (or outright murder) the so-called “unfit.” The CCHC report does a fine job of relating modern privacy concerns about newborn genetic screening to the sordid history of negative eugenics, but says nothing about “designer babies” or “improved” humans, the so-called “positive eugenics” that some advocate today. A considerable list of qualities can easily be compiled that nearly everyone except “cranks” would take into account when picking out the best specimens of his class. It would include health, energy, ability, manliness, and courteous disposition. Recollect that the natural differences between dogs are highly marked in all these respects., and that men are quite as variable by nature as other animals of like species. Special aptitudes would be assessed highly by those who possessed them, as the artistic faculties by artists, fearlessness of inquiry and veracity by scientists, religious absorption by mystics, and so on. There would be self-sacrificers, self-tormentors, and other exceptional idealists; but the representatives of these would be better members of a community than the body of their electors. They would have more of those qualities that are needed in a state–more vigor, more ability, and more consistency of purpose. The community might be trusted to refuse representatives of criminals, and of others whom it rates as undesirable. Let us for a moment suppose that the practice of eugenics should hereafter raise the average quality of our nation to that of its better moiety at the present day, and consider the gain. The general tone of domestic, social, and political life would be higher. The race as a whole would be less foolish, less frivolous, less excitable, and politically more provident than now. Its demagogues who “played to the gallery” would play to a more sensible gallery than at present. We should be better fitted to fulfil our vast imperial opportunities. Lastly, men of an order of ability which is now very rare would become more frequent, because, the level out of which they rose would itself have risen. The aim of eugenics is to bring as many influences as can be reasonably employed, to cause the useful classes in the community to contribute more than their proportion to the next generation. It’s clear that both positive and negative eugenics – the promotion of desirable traits and the discouragement of undesirable traits – fall within Galton’s scope. We may find negative eugenics, especially when it involves forced sterilization, more repugnant than positive eugenics, but libertarians should be troubled by both forms. Eugenics in Galton’s definition involves the state or ‘society’ deeming some traits desirable and others undesirable, and using state power to maximize the former and/or minimize the latter at the population level. Compare this to the ‘liberal eugenics’ of parents selecting for certain traits through pre-implantation screening or, in the future, genetic manipulation. In this case, no agency is empowered to act upon the population as a whole. The aim is not the improvement of the race, but the improvement of a single human life. A large part of my dislike for state eugenics is the single standard of desirability binding upon all. This, along with extreme coercion, is absent from liberal eugenics. The intended object of improvement – does the decision-maker wish to influence the population or an individual? Improvement or stasis – does the decision-maker wish to change genetic traits based on their own conception of what is desirable, or avoid genetic traits from being intentionally changed? Classical eugenics and the contemporary drive to enhance one’s own children through biotechnology share the desire to improve genetic traits. They differ, though, on the level at which they operate. In this respect classical eugenics and the contemporary opposition to liberal eugenics are similar: both define the boundaries of a desirable or acceptable life and use state power to enforce that standard. 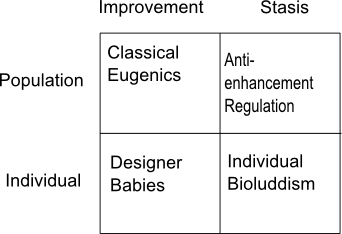 If I were king of Language Town, I would restrict the use of the word ‘eugenics’ to the upper left cell of the matrix, since this is clearly what classical eugenics was all about and liberal eugenics (the lower left cell) seems entirely different. Given that ‘liberal eugenics’ has become the standard term for individual enhancement of one’s children, I will grudgingly accept it. But I would ask – nay, plead – that anyone talking about enhancement keep the crucial distinction between classical and liberal eugenics, as well as the commonality of classical eugenics and collectivist stasism, in mind. This would all be too obvious to bother saying if it weren’t for all the confusion out there. The argument is straightforward: allowing a child to be born with a disease that will result in a lifetime of suffering and premature death, when a simple screening test could prevent it, is completely morally equivalent to allowing a child to die of infection when effective antibiotics are freely available. As genetic technologies and moral perceptions thereof mature, it seems very likely that most of the population will see failing to screen and remove any serious illness as child abuse. Looking further forward, I can easily imagine that refusing to enhance one’s children will be viewed with similar disdain: relying on the natural genetic lottery will be seen as reckless when it is easy to guarantee high intelligence and a cheerful disposition. Radical new medical technologies always provoke a backlash before being accepted – anaesthesia is an interesting example. Some hold-outs will always cling to the old ways of doing things, and these people will often be treated as villains when it comes to the welfare of their children. Christian Scientists are the obvious example today: strong norms and state intervention make it very hard for them to live their preferred life. Under democracy, activities generally become crimes as the median voter comes to see them as seriously immoral. This is a bit of a problem for those transhumanists who insist that human enhancement will be entirely voluntary, with bioluddites free to live out their limited existence without interference. At the very least there will be severe social pressure to enhance one’s children, and it is very likely that the state will mandate some minimal level of genetic care. As capabilities change so do the standards of care we feel we owe our children. If you refuse to enhance your child’s cognition in the future, you may be the object of as much revulsion as those who refuse to educate their children today. Assuming government continues to behave much as it does today, some sort of regulation here seems inevitable. As a libertarian, I’m not entirely sure how I feel about all this. One the one hand, I am very suspicious of strong norms, and even more so of government intervention, which exclude certain visions of the good life from decent society: people are often bigoted and extend their own value judgements onto others too easily, especially in the political sphere. On the other hand, encouraging or forcing parents to enhance their children will improve the capabilities of future generations, giving them a better life. I think it is morally wrong to seriously limit your child’s abilities below those you can feasibly give them. I don’t like it when the state gets involved in such things, because I trust parents to look after their children much better than the state. This raises the problem of thick versus thin libertarianism, and the tension between tolerance and autonomy in liberalism more generally. Will state involvement in parents’ genetic choices lead us back to classical eugenics? The original justification might be different – the welfare of the child rather than the strength of the nation – but the outcome may be very similar. If a liberal state with the power to mandate genetic efforts to enhance the autonomy of a child becomes illiberal, its potential for tyranny will be greatly enhanced by new genetic technologies. If, as I have suggested, the state is likely to get involved in human enhancement, libertarian transhumanists need to think very carefully about whether new technologies are on balance a good thing. With all the cries that selecting one’s babies will lead to a situation like that portrayed in Gattaca, nobody seems to realise that the movie’s portrayal of public coercion to have a particular sort of baby is already happening. The only difference is the ’sort’ of baby that parents are being pushed, by social pressures, to have. Yep. A similar argument can be made about outright state coercion. It’s always puzzled me how the eugenics movement of the 20th century, which arbitrarily defined what genetic traits were desirable and used the coercive power of state to promote them, can be equated with parents being at liberty to use biotechnology to give their children genetic traits the individual parents find desirable. Any attempt to regulate what genetic traits parents can foster in their children involves the state defining what is to count as an authentic and acceptable human life and using its coercive power to enforce that standard. Sounds like eugenics to me, but with a different value of eu-.